Here is a stupid invention. 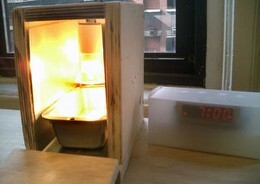 The Wake n' Bacon is a prototype for an alarm clock that wakes people up to the smell of cooking bacon. Every night before you go to bed, you need to set up the wake up time and also put a piece of bacon in the "clock". Is this how tough our lives have become that we need stupid things like this to wake us up. I am quite happy with my 5 dollar radio alarm clock that wakes me up to some nice music. If you snooze, you probably will start a fire with this thing. I am sure this will be a big hit in this country.